A.J. Brown – The Hidden Gem? Often overshadowed by his teammate, the allegedly human D.K. Metcalf, A.J. Brown is a good receiver in his own right. Projected to go in the first round, A.J. Brown caught the attention of scouts across the league after two very productive years at Ole Miss. While he may not be the freak of nature that his teammate is, A.J. Brown represents the new age wide receiver. A finesse wide receiver that can make almost any catch, Brown should fit into any passing attack in the league. First and foremost, A.J. Brown has great hands. In the three games that I watched, he only dropped the ball twice. The first drop came when he tried to catch a low pass while being blanket covered. The second drop came when he was knocked to the ground before he could grab the ball. He hauled in every other catchable ball throughout. Brown’s reliability is his strongest point, as a consistent ability to catch the ball is extremely important. He treats every pass as equally important, from the uncontested short passes to the double covered deep shots. Brown compliments his hands with his excellent route running style. All of his routes are crisp, and he demonstrated that he can run all routes on the tree. He pairs this with explosiveness off the line. His top speed is not exceedingly fast, but he hits his top speed very quickly. As Mike Mayock always says, “he’s quicker than fast.” That quickness comes into play not only at the line of scrimmage but all over the field. Brown often employs quick shifts to escape would be tacklers to gain extra yardage. It is often effective and suits his play style well. A.J. Brown’s quickness is a great asset, but he uses it so much because he lacks pure strength. Brown has to escape pursuers with a quick move because he cannot push through them. This is in sharp contrast to a player like N’Keal Harry, who is able to use his body strength to charge through defenders. Brown must avoid them entirely to continue running. To go along with this lack of strength, I rarely ever saw Brown block on tape, which leaves me with questions. How would he fit into a Lamar Jackson offense that will require him to block effectively? Finally, Brown played primarily in the slot position at Ole Miss. When he gets to the NFL, he could be asked to move to the outside. If he does make the move, will he continue to see success there? Being paired up with a slot cornerback that lines up far back from the line of scrimmage calls for an entirely separate strategy than lining up to a top cornerback in press coverage near the sideline. Brown could have trouble making the switch, as his productivity on the outside is all conjecture at this point. A.J. Brown reminds me of Julio Jones. He is an athletic finesse wide receiver that can make all the catches. Not only that, but he checks all the little boxes as well. Everything he does is done well. There is nothing that he looks over or skips. He works hard on every play and on every move. When he catches the ball, he pulls it in before running. When he runs a post route, he makes his cut quick and clean. All aspects of his game are calculated and executed well. 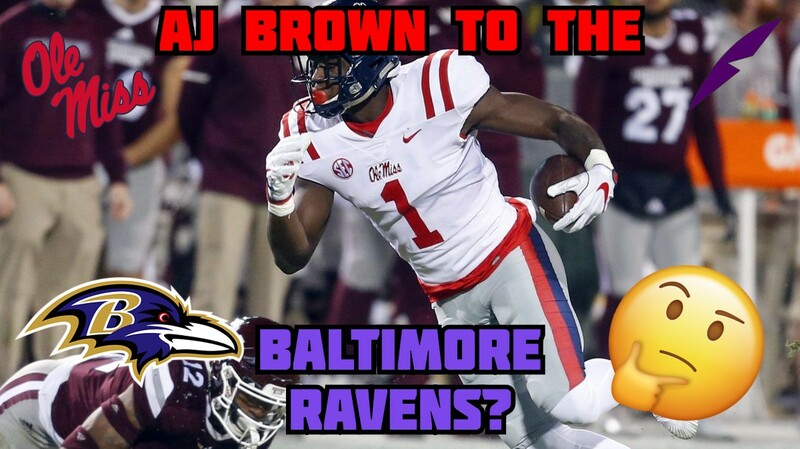 Should the Ravens Draft A.J. Brown? Yes, if he is the best player available at the 22nd pick. I believe that N’Keal Harry is a better wide receiver and a better scheme fit for Baltimore, but if he is off the board, and Brown is the best player available, it would be a good pick. Special thanks to YouTube viewer CéDub 98 for the suggestion to review A.J. Brown! If you want to suggest a player for review, leave a comment, email us at info@baltimorefeather.com, or tweet us @bmorefeather!